Our continued partnership with Shaw Sports reflects that commitment to our student-athletes and campus community. Johns Hopkins University athletic programs will enjoy new turf on the practice field beginning this summer. 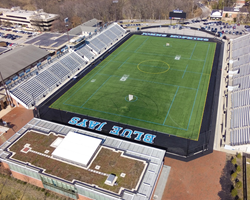 The school is updating the field with a Momentum 51 surface from Shaw Sports Turf and is expected to reopen June 5 in time for lacrosse, field hockey, and soccer camps and clinics. The summer programs serve more than 3,000 area youth from age six to rising seniors in high school. Assistant Director of Athletics Jon Gregory says Shaw Sports Turf originally installed the Momentum surface on the Homewood Field and practice field in 2005. After 10 years of high traffic use, he is proud to renew the surface with the same product. Historic Homewood Field installed a new Momentum surface in 2014. Construction on the project began April 22. Momentum is a high-performance synthetic turf system designed with a proven slit film technology. Mirroring the look and feel of natural grass, Shaw’s Momentum system is fast, dense and firm. In addition to its durability and performance benefits, Momentum’s fiber construction results in an umbrella effect that helps hold infill and reduce overall fly-out. “Being able to provide consistent surfaces on both Homewood Field and the Practice Field will allow our programs to move seamlessly between fields throughout the year. We feel this will provide our student-athletes a competitive advantage in having multiple venues to prepare in their pursuit of NCAA Championships,” Gregory said. Johns Hopkins Athletics has seen unprecedented success in the past two years. In the 2014-15 academic year, Hopkins Athletics finished 2nd in the final standings of the Learfield Sports Director’s Cup standings, marking the fifth consecutive year with a Top 10 finish. The Blue Jay men’s lacrosse and women’s soccer teams both advanced to the NCAA Semifinals, while women’s lacrosse and football both qualified for the NCAA Tournament; it was the fifth consecutive NCAA appearance for the football team. The school regularly hosts NCAA championship events on its fields. Upon completion of the summer programs for children, University NCAA sports teams will begin workouts on the new practice field in August.